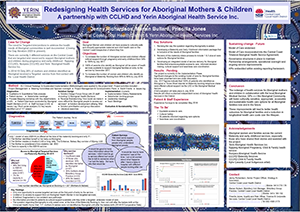 This project examined the patient journey for Aboriginal families accessing maternal and early childhood services within Central Coast Local Health District (CCLHD). It identified opportunities for improving access to care, cultural support, patient information and education, coordination and integration of care in partnership with the Aboriginal Medical Service. To increase the number of Aboriginal women and children offered cultural support through pregnancy and early childhood, from 54% to 100% by July 2017. To ensure 100% of parents who identify as Aboriginal are aware of health services available to support Aboriginal families on entry to the service by December 2017. To increase the number of women and children who identify as Aboriginal at the time of booking into the Maternity Unit, from 66% to 80% by July 2018. Improves access to culturally supportive care for Aboriginal families. Allows patients to make informed decisions about care options. Improves patient engagement with healthcare providers. Delivers long-term improvement in health outcomes for Aboriginal families. Improves staff communication, knowledge and resources about caring for Aboriginal families. Improves care coordination and integration between the public health service and the Aboriginal Medical Service. Improves cultural safety within the health system. The need for targeted interventions to address the health needs of Aboriginal communities is well documented. There are three services on the Central Coast that are tasked with supporting Aboriginal mothers and children during pregnancy and early childhood respectively: Ngiyang, Nunyara and Yerin Aboriginal Health Service Inc. Despite the availability of these services, in 2014/15 only 26% of mothers and children who identified as Aboriginal were referred to a targeted service when they first came into contact with CCLHD. Information gathered between August and September 2016 via data analysis, patient and staff surveys, meetings with service providers and workshops identified the following issues. there was capacity in the service. There were also concerns about when and why people were asked about their Aboriginality and where this was recorded, as early identification of Aboriginality determined the care pathways offered. There was also nowhere to record the identity of the father or child in the patient’s electronic medical record (eMR). Access to cultural support via an Aboriginal health worker was significantly limited for mothers entering mainstream maternity and early childhood services. Mothers considered to be a high obstetric risk must attend mainstream clinics. There was a lack of Aboriginal specific information and resources available in mainstream care. In addition, development and revision of information was not coordinated across services. There were a lack of clear pathways and opportunities for regular communication between services involved in the care of Aboriginal mothers and children, as well as a very limited means of identifying the services involved in a woman’s care via her eMR. A maternity and early childhood information package was developed to cater to the needs of Aboriginal families. This followed a review of all information provided to Aboriginal families. Information provided at the time of booking was revised to include all care options for Aboriginal families, an acknowledgment to country and more inclusive family imagery. This work will inform CCLHD principles for the development and approval of patient information for Aboriginal people. The maternity intake process was revised to incorporate the new phone script and information package, as well as care options available for Aboriginal families. Significant changes to the existing model of care for Aboriginal families has been proposed and is currently in discussion. This will ensure equitable access to care, informed decision making, cultural support and seamless care coordination. Yerin Aboriginal Health Service Inc. The phone script asking patients about their Aboriginality was perceived to be reasonably effective until the booking clerk went on leave and the staff member backfilling the position completed the intake using the old process. The phone script has since been formally documented in an attempt to maintain consistency. It’s possible that this approach could be adopted across CCLHD for all eMR registrations, however there would need to be consideration as to Aboriginal health worker resourcing and point of contact. number of mothers and children known to CCLHD as Aboriginal, who identify as Aboriginal after the birth. mother is breastfeeding exclusively on discharge. number of visits to health service website. Patient and staff experience surveys will be completed in May 2018. The results of this project will inform a planned, independent review of Aboriginal Health Services in CCLHD. Aboriginal consumer and community engagement. Understanding and engagement takes time. History is a powerful thing. On one hand, we can learn from the experience but quite often previous experience and fear of the unknown becomes a major barrier to change. Terms such as ‘integration’, ‘model of care’ and ‘continuity of care’ can have different meanings to different professional groups and people. The quick fix can often be the most difficult and time-consuming thing to implement. Where we sit as individuals, service providers and organisations on the cultural safety continuum, has a significant impact on our ability to adapt to meet the needs of Aboriginal people. Australian Commission on Safety and Quality in health Care (ACSQHC). Guide to better care for Aboriginal and Torres Strait Islander communities. Canberra: ACSQHC; 2016. Australian Government. Closing the Gap: Prime Minister’s Report 2017. Canberra: Department of the Prime Minister and Cabinet; 2017. Kruske S, Kildea S, Barclay L. Cultural safety and maternity care for Aboriginal and Torres Strait Islander Australians. Women and Birth 2006; 19(3): 73-77. National Collaborating Centre for Aboriginal Health (NCCAH). Towards cultural safety for Métis: an introduction for health care providers. British Columbia, Canada: University of Northern British Columbia; 2013. National Health and Medical Research Council (NHMRC). National Guidance on Collaborative Maternity Care. Canberra: NHMRC; 2010. NSW Ministry of Health. Aboriginal Cultural Inclusion Checklist for Maternity Services. North Sydney: Office of Kids and Families; 2016. NSW Ministry of Health. Building Strong Foundations (BSF) Program Service Standards. Policy Directive PD2016_013. North Sydney: NSW Health; 2016. NSW Ministry of Health. Good Health - Great Jobs. Aboriginal Health Worker Guidelines. North Sydney: NSW Health; 2014. Williams R. Cultural Safety - What does it mean for our work practice? Australian and New Zealand Journal of Public Health 1999; 23(2): 213-214.